Cadbury owner Mondelez International has received the all-clear for its multimillion-dollar redevelopment of the Cadbury World tourist attraction. 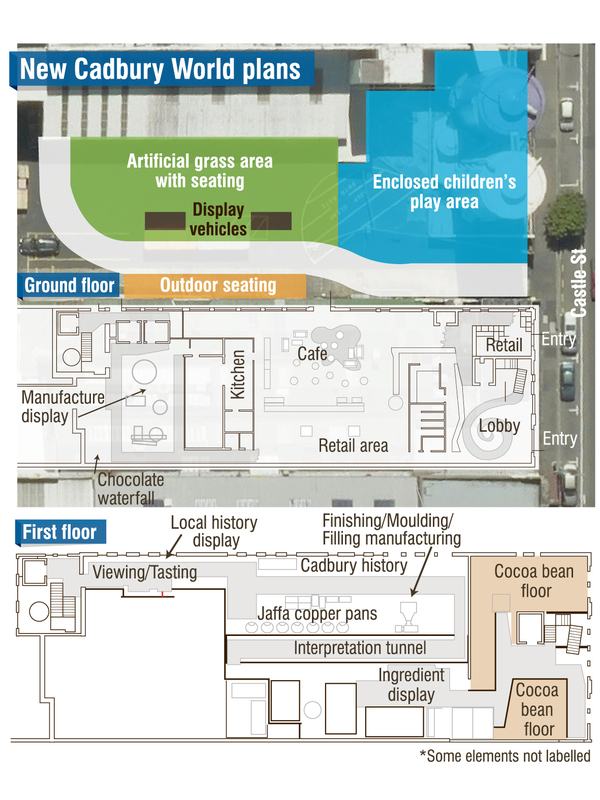 The Dunedin City Council has given Mondelez permission to move Cadbury World from its existing position in Cumberland St to the refurbished historic "Dairy Building" in Castle St. The relocation is expected to result in the attraction being six times larger. When Mondelez confirmed Cadbury’s Dunedin factory would close this year, with the loss of 350 jobs, it also announced a multimillion-dollar revamp of Cadbury World, likely to increase the tourist attraction’s number of full-time equivalent jobs from 25 to 50. The planned complex will consist of industrial tourist attractions including interpretation, demonstration and interactive activities, a retail area, a cafe, an outdoor playground and an open artificial grass area with display vehicles. The total retail area will be about 200sq m, and the 270sq m cafe will have seating for 50 people but be able to accommodate about 100. An adjacent smaller retail area will have direct access to Castle St.
As well as space for dining, the outdoor area will have a small stage, with associated seating, meaning it can be used to host small community and fundraising events. The complex will be open 10 hours a day, from 8am to 6pm, every day of the year. Occasional evening sessions for events relating to the chocolate-making industry may mean the cafe/retail space could be open until 10pm. The council’s consent decision notes the intention is to continue using the existing Cadbury World site for staff facilities, office space and storage, "at least in the interim". Pedestrian access from Cumberland St through to the new site was sought. Over the next few years, visitor numbers are expected to rise from 115,000 to 120,000 a year to more than 200,000. The new Cadbury World is expected to be completed later this year.